Savannah Georgia is known nationwide for its large amounts of old, "haunted" buildings. However, most do not consider its neighbor, Statesboro Georgia, to be the same. The quaint college town is in the middle of both growing and expanding its boundaries towards the seemingly endless fields that surround its campus. Most forget the fact that old historical buildings do occupy this land in some cases. 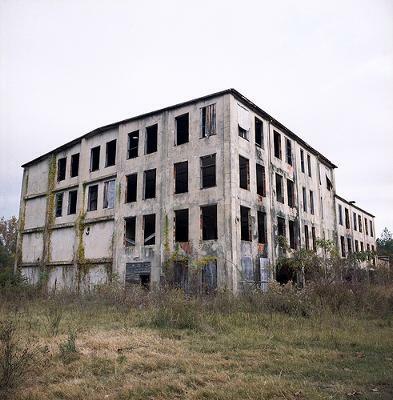 We look at the abandoned meat packing house, on Packing House Road, in order to see an example of this. The plant was up and running until it caught fire in the 1920s. It is said that 23 employees died in the fire due to the fact that the exits had been chained shut by the plant owner. Shortly after this, the owner committed suicide by a gunshot to the head. The four story building is a hair-raising site just to look at. It is noted by those who have entered the building that shadows have been spotted running to the exits. However, these shadows make it no further than the thresholds. For those less brave, paranormal events can be witnessed from outside of the building as well. On the far right window of the third floor, a woman with a look of terror on her face has been reportedly seen by those who have attended. Not only this, but on nights of a full moon a gunshot can be heard followed by a flood of screams. Through my own experiences with the building, I was unfortunately not lucky enough to find too much of the rumors to be true. 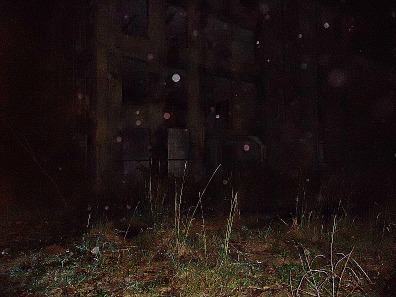 However, orbs were extremely abundant in all of the photos taken. Not only that, but temperature changes were noted throughout the time spent there. It seems the back left corner of the building is much cooler than the rest of the building. It’s by far one of the creepiest places in Statesboro. Just be warned, there is no telling who may be inside (and I’m not talking about ghosts). The shady part of town does make it a bit dangerous to just play around in. Though, I’ve heard of no trouble from there yet! Best of luck to anyone who attempts to discover what lies inside the abandoned building. Been in multiple times. The less people you go with the better. Have heard things like slamming or something chasing me and my friend alone, but when we brought friends nothing happens. The only way up is through the cracked wall, the city has since put a fence up on the inside so you can't go up. Cameras and trip wires are all setup through the building. If you set one off you better be ready to run. Just left the meat packing plant. I did not see any evidence of any construction or improvements. We had great keg parties here in highschool. no they dont that building is completely unstable .. It's been bought, cleaned up, and is being converted into apartments. I'm not superstitious at all and I went about 3 times the past couple days, once during the night and made it to the 2nd floor without any signs of supernatural activity. The reason I only went to the second floor was because my friends were all too scared to go with me xD I went to the roof through the ladder and onto the roof during the day and it was pretty cool. I had a lot of fun even though no one would go up with me. No noises or whatever so far, planning on going to this place frequently. I have been multiple times over the past two years. And just went back this past Saturday. I made it all the way up the sketchy ladder and onto the very top roof without incident, and to the fourth floor multiple times as well. But it always seems to get eerie as we are beginning to leave. Those I am with report seeing figures, we hear strange sounds, and even threw something down the elevator shaft once to hear it be tossed back up... needless to say that was a little scary. But I have never personally seen the figures nor felt an entity, not to say they aren't present but I'm unsure. Although this past time we went there we some boxes placed on a table in the first floor that seemed to be new, I forget what they were for but I think one was a vacuum. The main thing that seemed strange to me about this was the fact that when we left there was a case of water on the table that I did not remember from prior, but one of the three guys I was with said he remembered it, so I'm not sure. This past time really was not scary for me being the only girl with three guys I felt safe, and the multiple trips in the past helped as well. But I will say I liked going at 2 am because we usually go around 11 or 12 and that's just a little too early.. If anyone is interested, I am a male self-portrait model and have some photos from my session at the Statesboro Meatpacking House on my site at http://www.christopherryan.com/modeling/portfolio/self-portrait-work/abandoned-meat-packing-plant/. I think it's haunted. My friends and I played there in the late 80s as kids. There's a room there that's always very cold and had footprints on the ceiling and under boxes. It was pretty weird. We would hear some strange sounds but that was about it. No shadows running around. I'd say it's haunted but not in the way some of these people are saying. I would avoid it for now unless you want to get mugged by crackheads. I was dragged there last night by my friends. We did the usual touring everyone else does but didn't go higher than the third floor. The place was eerie regardless but nothing major happened so we left. I just saw a picture one of my friends took last night and there's a ghostly figure (upper half of it's body is very prominent) behind one of my friends. I won't be returning to say the least. The only really spooky thing we saw was a cat. My friend shined his flashlight and we saw two glowing red eyes...but then I remembered that his flashlight had a red beam. Despite my protests, we explored all four floors, and it was just as creepy as everyone says. Nails hanging from the ceiling, holes in the floor, random elevator shafts, rusty tools from when the place was still in use, instructions for workers still on the walls ("no spiting on floor"--yes, they spelled spitting wrong! )...and that was about it. We were sure at one point that we were totally going to get killed, but then it was just another group of college kids coming to check out the place. Another part we didn't explore was what I guess was the fifth floor. There weren't stairs...just a ladder, and we obviously weren't going to risk climbing up. now that i know what it is i want to go back but i dont want to go bymyself .. I went there last night & again today. Didn't go in as I was alone & the place looks dangerous in a physical sense. Didn't hear or see anything but is very creepy. It may or may not be haunted but it's definitely creepy. I would think like any haunted place some people will have experiences while others will not. According to most accounts it's haunted. I was only in for about 15 minutes because I didn't want to catch a trespass charge. I knew a family that actually lived by the property and they had several unexplainable experiences. I was inside, i spend almost 2 hours there and i tell you even during the day time that place is haunted. i had no clue where i was at the time i entered but now so much i experianced makes sense. I have really gorgeous ( well spooky ) photos of the building inside and out. The feeling of being watched or followed was with me until i left the property, As i walked up the first stairs i heard shuffeling right behind me but there was no one there. and 2 spots in the building really wrenched my gut, my hair stood up and it was like do not enter trough here, i just didnt. as i left and was outside i heard what was working noise, like a machinery or something and i swear someone called out so i stood there for 10 minutes paralized. you just can not explain why it is 80 outside humid and hot and inside you can see your breath infront of you. The chills were real iprobably explain it by saying i was alone in a abandoned building so of course i was afraid but i have done hese so photo advenures before and this was differant. the huge metal sliding door i think is the spookies it is partially open so you can squeeze trough to an dark semi long hall ... that was really creepy and if you go left after that hall you will see a room, i swear there was a fire in it, and that room gave me the worst feeling lol .. i cant wait to take a closer look on all my photos now .. Most of this info seems to be rumor. From what I can tell, the plant opened and closed several times and finally failed in the Depression. No one died in there, although the original builder did leave the country, and the fire was after it had been closed for years. I guess it could be haunted by the hundreds of pigs who were slaughtered there? I can remember going to parties at the packing house (actually inside the building) when I was going to Statesboro High School in the late '90's. As I recall, it was not haunted. Fun times, though. I am sorry to inform everyone but there are no ghosts inside the packinghouse. I have spent a many of night there with friends when we were back in highschool a friend I went to school with parents owned the land and we would throw parties there all the time and spend the night. I will say that there would always be homeless people and squatters that we would have to run off so if you go please be careful and there is also open elevator shafts in the floor that are not covered so you will fall three or four stories before hitting the concrete. my advise is look from the outside but do not go in unless you are with someone who knows his or her way around the packinghouse!!!!! what is the exact address of this place? ive been there but im trying to look it up on google maps and the road is really long. I went to gs in 1965 and 1966 before finishing at uga. The only meat packing plant i remember was one by a lake where the owners would open their doors ever year for free hot dogs and cokes. I knew and hung out with a lot of the locals and never heard about a haunted plant, never. Have been by this place so many times. . . this place is truly spooky even in broad open daylight! No joke, this was one of my favorite memories of college. I'm a Boro native, but made it 21 years without ever having set foot in the packing house. That's why my senior year at GSU, the night before Halloween, my friends and I decided to go all out. 2 of my friends were too scared and waited outside. I went in with the other 2, and we were immediately captivated. Some of the grafiti and trash inside is just garbage, but there's also some genuine artwork and poetry painted on the walls. But enough about that. There were several places and instances of debris inside that back up the story of the fire, and the whole place as an eirie feel to it. We experienced the temperature drops, but discovered that it mainly happens near the windows (where the wind picks up). That wasn't scary. We also heard a big moaning noise around the 2nd floor, but that turned out to be the wind as well, so nothing scary there. However, there's a big metal shaft that runs through like the first 2 or 3 levels. As we made our way up to the top floor, we heard a sound like someone hitting the shaft with their hand. We immediately suspected our friends trying to scare us, so we went to the window to confront them. We were surprised to see them sitting near the truck by the road. Although puzzled, we shook off the noise. Then, as we proceeded up the stairs into a big open room, it echoed again. This time, we all heard it at the same time and stopped in our tracks so that everything was quiet. Suddenly, we heard a noise like someone striking the metal shaft with a brick, and we were scared %#@≤ss. We sprinted down the stairs, and didn't stop running till we were in the truck. True story! I would advise caution to anyone trying their hand at it, as it's not the safest place structurally anymore, and I'm pretty sure it's on private property. The cops might not be as enthusiastic. This was an extremely well written of the description and activity in the Statesboro Packing House. It clearly stated that who, what, when, and why and other occurrances that have happened there either by photographs or other reports from a variety of people. I have read other posts for Haunted Hovel, and some of those posts I can hardly understand what the author is saying due to either poor punctuation or misspelled words. That case is not here, and I was able to read and follow what the author intended to say.